I deconstruct shape and form, my line drawings and paintings of faces become guides for the interpretative mind. Uta Brauser, size 6′ x 4′, unstretched, acrylic on canvas, spray paint. Materials Archival Grade Photographic Cardstock and Ink from Inkjet Printer. By Uta Brauser, 8 1/2″ x 11″. I deconstruct shape and form, with line drawings and paintings of faces. 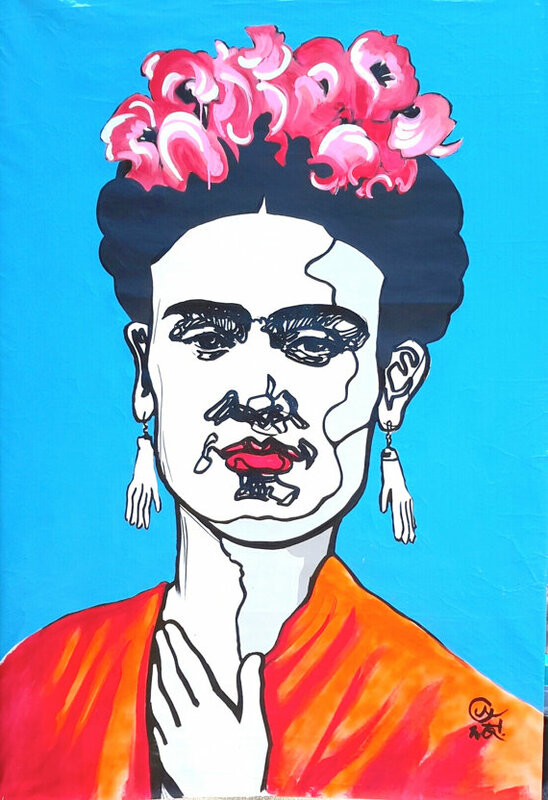 My FRIDA KAHLO portrait series celebrates this artist, her daring energy, her cultural authenticity and yet individuality, standing up as a female. Original Painting Available Here: Artist UTA BRAUSER, original size 6′ x 4′, unstretched, acrylic on canvas, spray paint. 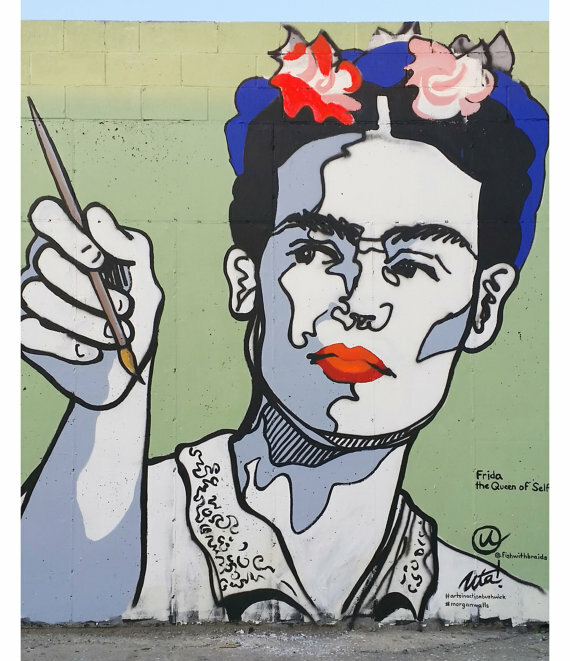 The painting is a mural in Bushwick, Brooklyn NY, part of the Morgan Walls series, organized by Arts in Action Corporation, a non profit for the arts. Uta Brauser is the executive director and coordinator of the mural program. The original painting is: 12 foot x 10 foot, Morgan Ave x Harrison Place, Brooklyn. Acrylic and spray paint on cement wall. The mural was painted over by a graffiti artist in the claim of public wall space tradition. This FRIDA KAHLO painting depicts her as the queen of selfies, before the existence of smart phones, therefore she holds a paint brush.